Ted Smith's paintings represent powerful and often bold impressions of his surroundings and are consumed with knowledge, understanding and love of paint. Like many landscape artists, Ted Smith uses his love of the land as a vehicle for exploring the marriage of colour and form. Ted Smith entered the Vancouver School of Art in 1960. At 27, Smith was an older student: his intent was to train as a commercial designer, thus engaging a career that offered steady employment in a creative field. However, Smith never did manage to leave the painting studio, a fortuitous occurrence for his artistic career. Ted Smith's paintings have developed with his aesthetic over the course of thirty years. 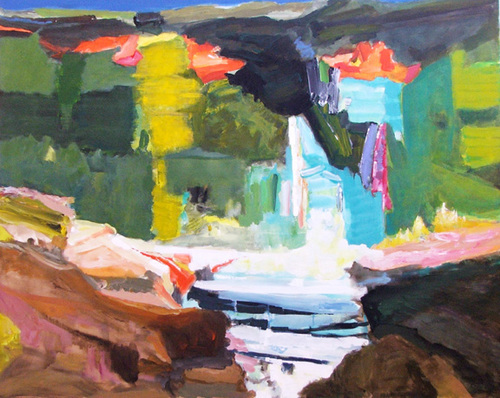 They have moved from generalized ideas or realistic renderings of the landscape to personal impressions of his environment motivated by colour, line, shape, atmosphere and light. 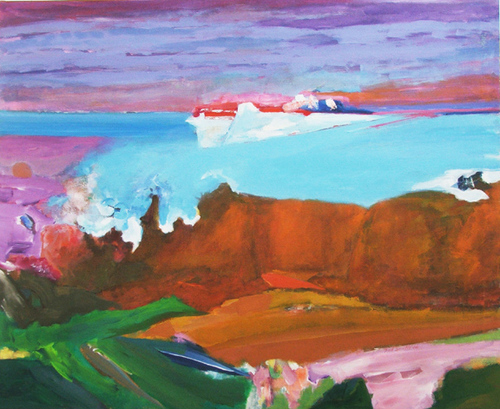 Smith seems preoccupied with vistas: physical and mental views embracing a series of patterns, movements and colours. His emotive sense of space integrates line with shape and form with colour, alluding not only to a memory positioning of the land but also of pleasure and of conscious and unconscious responses to the world that surrounds him. Ted Smith's paintings are open and contemplative and provoke, like the land dancing under an aurora borealis, a sense of wonder. Ted Smith's paintings are qualified by their devotion to the theme of landscape, and by their exploration of the possibilities of colour. 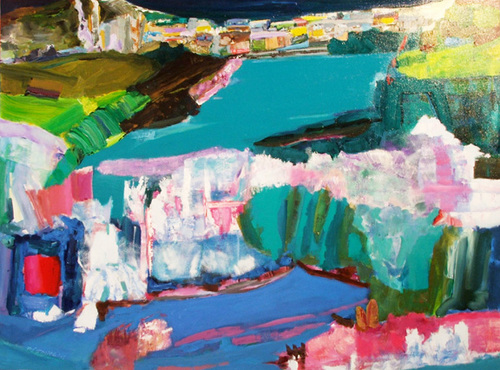 His concern is with the purity of colour and he uses his love of landscape as a vehicle for exploring the juncture where colour and form overlap. In Smith's studio are boxes containing coloured papers arranged and categorized not only by colour but by hues and tones. Smith pins them to his canvases when painting, as if to audition not only the hue but the shape he cuts into the paper. These bits of paper indicate that use of colour, enhanced by intuition, is never random. As Smith has learned to see the land, he has developed a sophisticated visual inventory of the possibilities of hue and tone within the land, sky, and water. 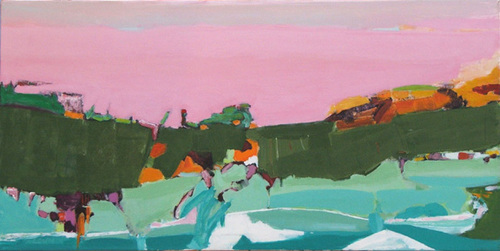 Ted Smith's description in paint of the topography of the region is a steadfast depiction of the sensitive relationship between human and landscape. The quietness of his pictures is not only due to the quietness of the scene -though that is somehow essential to it -but to the restraint of the painter's standpoint: he instinctively concentrates, condenses, and eliminates, conscious of his role as mediator and translator. This perilous reduction of the problem has an enormous virtue -congestion and frustration have been dissolved away. This relationship works in kind: the paradoxically frail yet harsh beauty of the South Central Interior of British Columbia brings out the finest skill of this artist. We are left with an image from life we can hardly forget and the knowledge that an image, like an artist, can be at peace with itself. 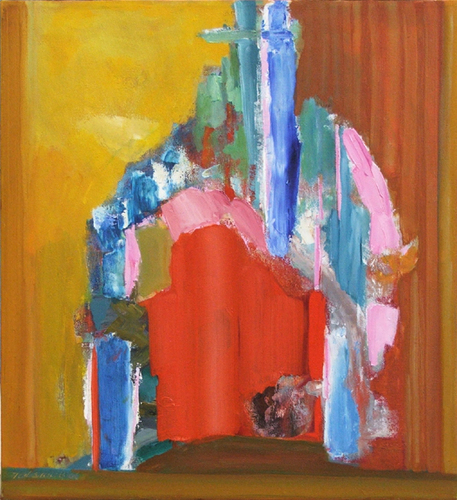 Ted Smith is represented by The Art Ark Gallery, Kelowna, B.C. Ted Smith lives in Kamloops BC. He is represented by the Art Ark Gallery in Kelowna BC.